Don’t have time to listen? So often we confuse busy-ness with productivity, filling our calendars, being efficient and getting things done. Relaxing your thinking, slowing down and getting settled is a way of tapping into your creativity and wisdom and ultimately being more effective and showing up more powerfully in your life. Slowing down can feel so challenging because it seems so counterintuitive - we think that if we slow down, then we’re not being productive. Slowing down means different things to different people, so the first thing to identify is - what would slowing down look like for you? And what is keeping you from doing that? Challenge the idea that slowing down leads to decreased productivity or ambition. Think of when you’re on a plane and how you’re told that when the oxygen mask drops, put yours on first before you put one on your child. That makes sense to us - if we can’t breathe and we don’t have the energy and strength within ourselves, then we cannot provide for the person sitting next to us either. Imagine a teacup (Allegra uses her whiteboard here in the video to diagram this out!) and the teacup represents all of your energy, resilience, time, everything that is within you that you have to give. Outside of the teacup are all of your responsibilities, and the tendency is to just start giving from right in the teacup. But then there’s this chronic feeling of emptiness, a gradual sense of burnout, of not having space for ourselves. Something is missing all the time. Imagine instead that the teacup is on a saucer, and instead of giving from out of the cup, we fill the cup so much that it starts to overflow, and instead of giving from the cup, we give from the saucer. And what’s really important about this is that either way - you’re giving. In the second scenario, you’re giving from a very different place energetically when you take time to recharge and reboot - you can give more because it’s from a place of abundance rather than scarcity. Instead of saying “I really want to do this thing, BUT I’m scared, or my parents might get upset, or it’s going to be difficult to tell my partner about it” - what if you change that to AND? “I really want to do this thing, AND I’m scared” opens up the possibility that both can happen at the same time. Because if we have to choose one or the other, we start to think we can’t do the things we want to do. How does this actually work when you feel really overwhelmed and slowing down seems impossible? Overwhelm is a mental job - it’s a mind game. We’re never overwhelmed by the thing in front of us - it comes from all the thinking about all the other things we have to do. Often we confuse overwhelm with having to do everything at once. Instead, one of the places to start is recognizing that the feeling you’re experiencing is not coming from all the stuff, it’s coming from all the thinking about the stuff. Instead of thinking that as long as all this stuff exists, you’ll feel this way, what if all that stuff existed but you could just calm down within that storm of stuff. This is a deep and powerful practice for people - it requires really getting curious and taking ownership of that feeling. Otherwise, we think that as long as the stuff is out there, we will always feel overwhelmed, and that’s a very disempowered way to live one’s life. It’s thinking that is at the heart of all of our perception and experience of life. How many things are there really on your to-do list? Maybe there are just four things, but they feel infinite because our language around this allows us to just give in to this idea of “I have so much to do.” Even if it’s twenty things, it’s not infinite. If you get things down on paper, then you can get out of your head and take a look at what is actually going on. It’s not that you’re doing stuff all day, it’s that you’re thinking all day - and that’s great news because overwhelm is no longer this thing that is brought onto you. It’s just a thought storm that’s passing through. 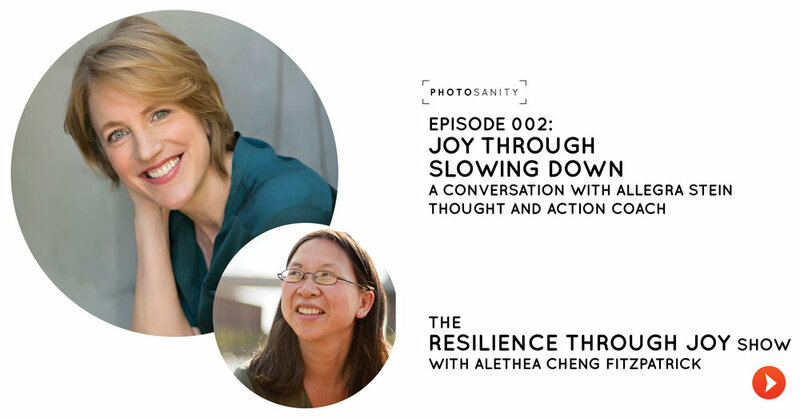 When we define joy as the state of being present to all our feelings, slowing down is what allows us to feel all those emotions - that can be uncomfortable when we have misconceptions about what emotions mean, and that can be a block to slowing down. What might you be avoiding by staying overwhelmed? What would it be like if you had nothing to do today? That can be very edgy. Often the challenge is not in getting stuff done, it’s in not getting stuff done - but that’s where all this beautiful discovery can happen of deeply held beliefs and thinking and emotion. Busy-ness can be numbing - when you’re rushing on to the next thing, you don’t have to be present to your emotions. Driven, ambitious women often have a hard time with the idea of mindfulness or yoga or meditation. Instead, photography can be a really easy, natural way to slow down. The narrative in popular culture is that you have to put down your phone in order to be less distracted, and what most people experience is that their camera does seem to take them out of the moment or even ruin it. You can use your camera to find joy and be more present and in the moment - for me, when I pick up my camera, everything else fades away in to the background, and even thinking about traditional photography concepts such as light or composition heightens my awareness of the present moment. There’s a lot of toxic stress right now - but we still get to experience joy, and our cameras can help us find it. What I teach is focusing on how it feels, not how it looks, which sounds counterintuitive for photography which is so visual, but when you are worrying about how your photos look, that’s future thinking that is taking you out of the moment. Instead, when you really focus on how it feels in that moment, you can find more joy through photography - and the amazing thing is that you end up taking better photos too, and by that I mean photos that are more meaningful and capture the emotions you want to remember. Photography is almost like a gateway drug to slowing down, as people are photographing their kids all the time, and you can make a powerful but simple tweak to how you are approaching it. To find out more about working with Allegra visit http://allegrastein.com. If you'd like some support with your parenting and your photography, you can sign up for a free Photosanity consult where we’ll get on the phone and talk about your biggest challenges as well as what you most want as a parent. I’ll give you your very own customized strategy for finding joy and connection through photographing your kids, as well as three steps to put it into action.